We have simplified the Tesnit® product types to 8+4 types; 4 economical, 4 industrial and 4 reinforced types. The naming and colours of some product types are undergoing a change that is in line with our main product brands, which will ensure that the names within are aligned and consistent. With these changes we can guarantee a consistent quality, appearance and naming of all of our products. Naming: We have changed some product names in order to create a consistent system that would allow for easy recognition of our products within the marketplace. These name changes will also streamline our complete distribution network, ultimately benefiting you our loyal partners. We have combined Tesnit BA-GL and Tesnit BAGL 3000 into one product, the new Tesnit BA-GL. Additionally, we combined Tesnit BA-CF and Tesnit BACF 4000 into a single product, taking the name Tesnit BA-CF. 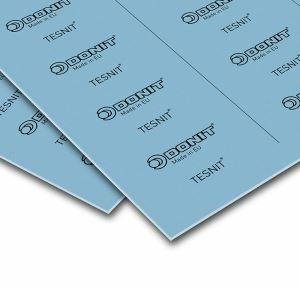 We changed the name of Tesnit BAM 6000 to Tesnit BA-M.
Colour: Each product type in our Tesnit range will also have its own individual colour to ensure quick and easy identification. Tesnit BA-203’s basic colour is going to be changed to yellow and Tesnit BA-GL to a greenish-blue (the former Tesnit BAGL 3000 colour) to assure a clear differentiation amongst our products. Branding: Over the past year we have discovered counterfeit gaskets in the market bearing our company logo. To ensure the reliability of our products and to reassure you, our partners we have updated the Donit branding on all of our gasket sheets.